Continuing our series on the Io abstracts for this year's Lunar and Planetary Science Conference, we now take a look at "Ionian Volcanoes Reveal Their Temperatures" by Daniel Allen and Jani Radebaugh. The authors took a look at Cassini's eclipse images of Io from that spacecraft's December 2000 encounter with Jupiter and measured the color temperature of several of the hotspots that were visible. In late December 2000, the Cassini spacecraft conducted a distant flyby of Jupiter on its way to Saturn. While the data acquired by Cassini had much lower spatial resolution than most of the images acquired by Galileo, the greater data volume provided by Cassini's working high-gain antenna allowed Cassini to acquire images with higher temporal resolution. 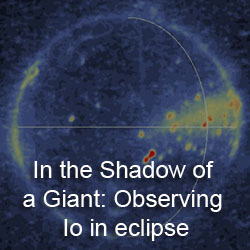 The abstract mentions that more than 500 images were acquired during three Io eclipses with a resolution of 61 km/pixel. 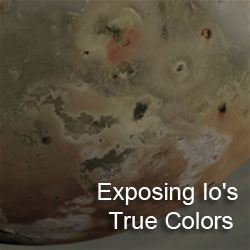 These images revealed a number of features visible in higher spatial resolution Galileo data, including atmospheric emissions such as the bright equatorial aurorae and a fainter halo surrounding Io. They also revealed several hotspots, the most prominent of which is Pele. Radebaugh et al. (2004) used the ratio of the pixel values from clear and near-infrared (IR4; 975 nm) filter data to determine the color temperature of Pele, measured at 1500 ± 80 K, consistent with other datasets from Galileo. Allen and Radebaugh have now gone back and performed similar analysis on three other volcanoes in the Cassini ISS data: Loki, Wayland, and Pillan. 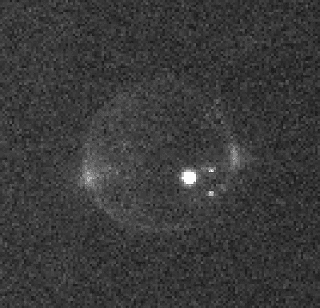 All three are much fainter than Pele and this decreases the signal-to-noise ratio of the resulting measurements and the error bars, compared to the earlier Pele measurements. The authors averaged the pixel values of a 5x5 box around each hotspots in both IR4 and CLR filter data, subtracted the background DN level, and then calculated the CLR/IR4 ratio. Using a blackbody response curve, the authors could then correlate their ratio calculations with color temperature in kelvins. They found temperatures of 1384 ± 238 K for Pillan, 1249 ± 148 K for Wayland, and 1409 ± 225 K for Loki. That latter temperature is actually higher than most previous temperature measurements at Loki. The authors also tried to look at the trend in the CLR/IR4 ratio with emission angle for each volcano. Emission angle is an angle measure of the distance from the sub-spacecraft point with 0° at nadir and 90° at the limb. 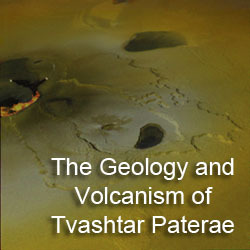 If a volcano has a significant vertical component, such as from a lava fountain, the color temperature should increase as the more foreshortened view of an surface flows should decrease the low temperature component and the more straight on view of the lava fountain should help to increase the amount of high-temperature lava seen by the detector. If a hotspot has no vertical component, then the color temperature should decrease as the more foreshortened view of surface flows prevents Cassini from sensing warmer lava visible through cracks in the lava crust. The plot shown in the abstract for Pillan is pretty noisy due to the low signal-to-noise ratio, but it seems to suggest that color temperature decreases as emission angle increases, indicating that there is no significant vertical component. The authors again present this as a work-in-progress (then again, what LPSC poster isn't). They hope to continue their work comparing color temperature to emission angle with the idea of better constraining eruption styles at the fainter hotspots seen by Cassini.